The Case Mason Executive Management team has extensive experience and substantial expertise in the packaging industry, with strong track records of leadership, performance and packaging ingenuity. Kevin Perzan joined Case Mason in 2012 as President. With extensive distribution, operations and sales experience, Kevin is responsible for our strategic business planning. He leads by example with a high energy customer and employee partnership driven work ethic. Kevin combines his strategic thinking with a very hands-on daily management style. He received an undergraduate degree in Business from Towson University. Kevin is involved with many local charities, enjoys boating and is married with 4 children. Scott joined Case Mason in 2007 as VP of Sales and became President/VP of Sales in 2008. He has transitioned into Chief Growth Officer role in 2012, responsible for revenue, client engagement, and partnership strategy. Prior to Case Mason Filling, Scott held various Senior level Sales, New Products, Organizational Development and Strategic Management roles at Comcast and The Baltimore Sun. He has a degree in Business Management and Economics from James Madison University. Scott is married, has 3 children, is an active board member with Boys Hope Girls Hope and loves playing pickup basketball. Stephanie joined the Client Services team at Case Mason in 2009. Stephanie and the Client Services team work closely with our customers to understand their businesses and develop customized solutions to meet their specific needs. Stephanie takes pride in forming true partnerships with our customers and helping grow their businesses. Stephanie also leads the Marketing Department and is working to drive new business into Case Mason. Prior to joining Case Mason, Stephanie worked as a marketing coordinator for a major cable communication company. She received a BS in Communications from Villanova University and is currently pursuing her MBA in marketing at the University of Baltimore and Towson University. Greg joined Case Mason in 2010 as Quality Systems Manager. In his position as Quality Systems Manager, he is responsible for overall quality, specifically in the areas of food packaging and filling, quality systems development and process improvement. Previously, Greg held quality assurance management positions at Taylor Fresh Foods, Fresh Express, and Cadbury Beverages. His professional memberships include the Institute of Food Technology and the International Association of Food Protection. Greg received his BS in Biology/Business Management, is Better Process Control School and HACCP (Standard and Seafood) certified, and received a Sanitation Short Course certificate from Penn State University. He has also received certificates of training in Recall Leadership and Food Security. Greg has been designated as a certified Food Scientist by the International Food Science Certification Commission. Ron joined Case Mason in 1994. During his tenure with the company, Ron has held positions as Warehouse Manager, Production Manager, Materials & Supply Chain Manager and presently is the Strategic Procurement Manager. In addition to sourcing and procurement, his current responsibilities include data analysis, customer service, IT and systems development. Ron’s previous contract packaging industry experience includes positions as production manager, customer service manager and inside sales manager. Mike Schmidt joined Case Mason in 2016. Since coming aboard, Mike has demonstrated the ability to lead his department and motivate those around him on a daily basis. His duties include inventory management, order fulfillment, and shipping & receiving coordination. Prior to joining Case Mason, Mike held the position of Department Manager at Rite Aid where he managed the front end delivery service to 900 stores and oversaw daily communication between 12 separate departments. Mike earned a BS in Biology from Towson University and was also a member of the Towson Tigers football program during his time in college. Today, Mike is married with three children. Marty joined Case Mason in August 2013 as a member of the QA team. He quickly moved into the position of Lead QA, overseeing the daily operations of the quality department and streamlining paperwork flow and line inspections. He is now Production Manager where he is responsible for all production activity including all filling, packaging and the assembly departments. Marty’s greatest asset is his ability to build and motivate his team. Marty holds a BS degree in Business Management and Marketing from Towson State University. Prior to joining Case Mason, Marty held senior sales and marketing positions with Waste Management, A2Z Environmental and T & P Contractors. Amy joined Case Mason in 2018 as the Controller. In her role, Amy is responsible for managing the accounting and finance functions. 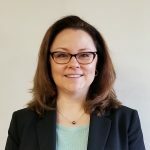 She brings over 20 years of experience from multiple industries including manufacturing, utilities, construction services and accounting consulting. She received her Bachelors in Accounting at Chatham University in Pittsburgh and in 2012 she earned her MBA at Loyola University Maryland. Amy enjoys working hand-in-hand with management and operations as an active a member of the team and a leader in Case Mason’s continued success and growth. Raised on the Eastern Shore, Amy loves the Chesapeake Bay. When not working she and her husband are active in their community and enjoy traveling, spending time with her family and volunteering.